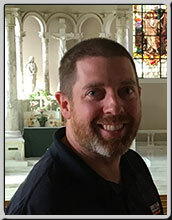 eath Morber is the Director of Music at Saint John Catholic Chapel on the campus of the University of Illinois in Champaign-Urbana. There he directs two choirs and works as a mentor to university students who take on leadership roles with the other ensembles at Saint John’s. Heath is the progenitor of the English Motets project, a venture to adapt hundreds of Renaissance motets from their original Latin texts into English ones. In his free time, he enjoys learning languages, sports and keeping up with his wife and five young children.